Frank is now a dad and a California State Firefighter (Captain) who resides in Nevada City. of his friends), and more. 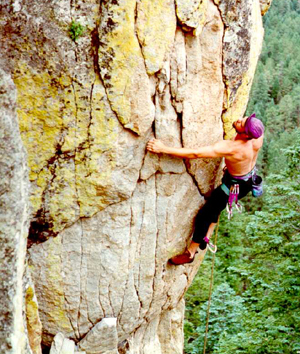 He enjoys kayaking and climbing, obviously, as seen in these pictures. 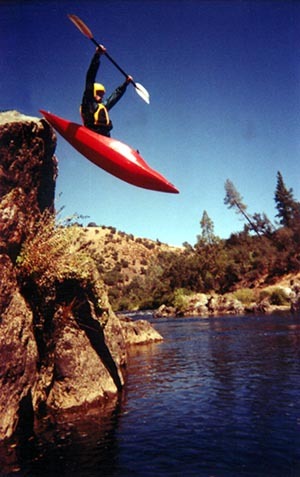 Enjoy these wild pictures of his kayaking and climbing! 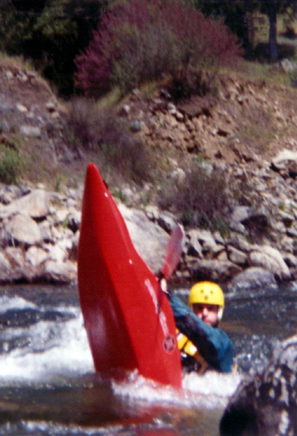 (aka: I meant to do that, really...) This is called a "stern squirt" in kayaking lingo. 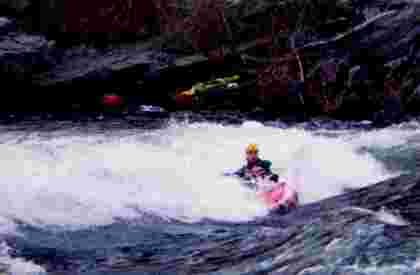 It is what happens if you back paddle very hard while leaning the "wrong" way moving into the current from behind a rock. standing wave and trying not to get flipped over. "Seal Launch" (for obvious reasons, according to Frank) I'm still waiting for Frank to tell me the location, date, and photographer. Evidently this photo was taken in 2000. I love this photo (for colors, balanced composition, etc. ), but . . . gulp . . . that's my beloved son sailing off a cliff in a little kayak!!! Frank on a trip to Yosemite Valley. 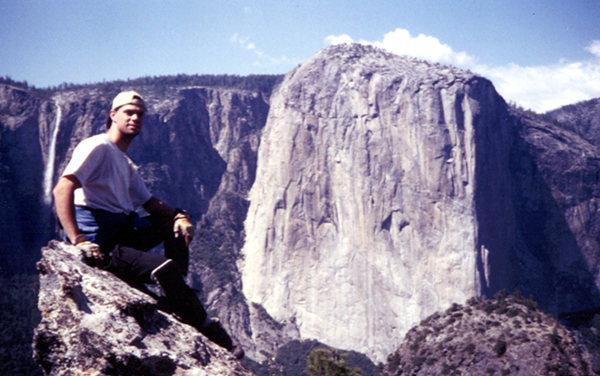 Here he sits atop Leaning Tower, 1000 ft. off the floor of Yosemite Valley. Bridleveil Falls is behind him on the left. El Capitan, the prominent background feature, rises about 3000 ft. off the Valley's floor to an elevation of about 7000 ft. above sea level. 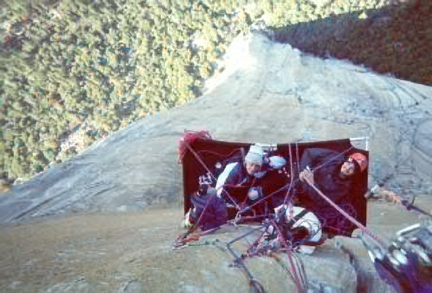 Tony and Chuck on a portaledge. Photo looks down about 2500 ft of El Capitan (Yosemite Valley). Yes, those are the tops of very tall trees you see at the bottom. The longest route up El Capitan is 3300 feet. Routes have taken, variously, 4, 5, and 6 days up the face. This is a growing, but impressive collection and well worth a visit!